Congress President Rahul Gandhi today in a tweet attempted to criticise Railway Minister Piyush Goyal. 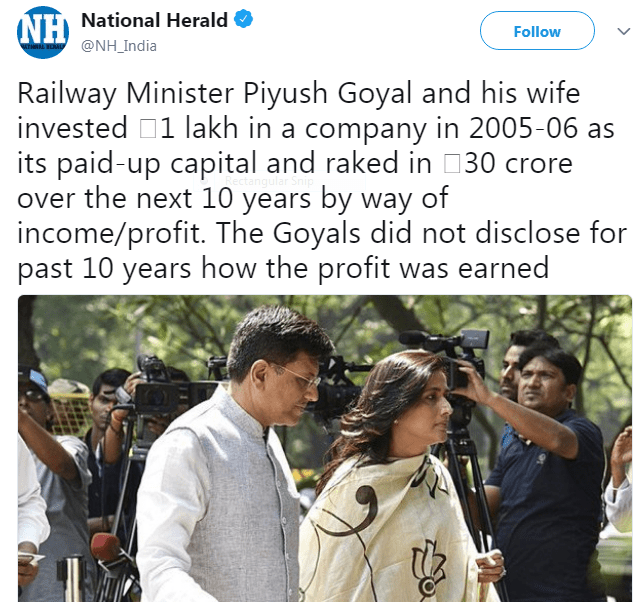 Certain media outlets today ran the news of Congress alleging that a company owned by Piyush Goyal’s wife Seema Goyal had made a profit which was 300 times its paid-up capital in the last 10 years. Congress also asserted its earlier allegations that Goyal has close ties with Rakesh Agarwal and Mukesh Bansal of Shirdi Industries Limited. The congress mouthpiece National Herald ran the ‘news’ alleging that the Goyals had not explained how this profit was earned. Following this, Congress President tweeted that these are the ‘chamatkar (miracles)’ of Shirdi and the miracles have no limit. Rahul Gandhi’s tweet, however, did not amuse the Shirdi Saibaba Sansthan Trust at all. Dr Suresh Haware, who is the Chairman of the trust and CMD of the Haware properties, was quite displeased at the snide remark involving the famous pilgrimage site. Dr Haware tweeted that it is very painful to see the holy site of Shirdi being pulled amidst politics of allegations and counter-allegations. He added that he, on behalf of all the Saibaba devotees, condemns this attempt and Rahul should apologise for his tweet. Many political leaders and private individuals have also expressed displeasure over the insensitive remark. The BJP had denied the allegations against Goyal and called it an attention diversion tactics. Piyush Goyal had resigned from the chairmanship of the company in 2010 and he had stated that the company’s financials and performances over the year have no conflict of interest involved. The attempts of certain portals to malign the image of Piyush Goyal were also rebutted and the allegations were found to be unsubstantial.